While this column has been online in the Recipe Box at Kitchen Parade for awhile, just recently, I made it for the first time in a few years -- just to add a photograph, no more. And then I made it again. And again. And again. 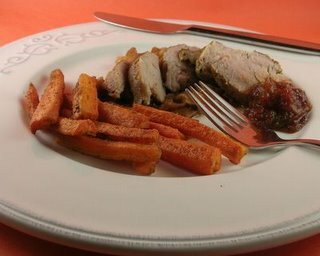 Tender Pork Tenderloin is one of those every-day staple recipes that's just so easy and so good, it almost cooks itself. And the carrots, ah, the roasted carrots spiked with cumin! They're sooo good. And so here is the column again, in case it's been overlooked. Enjoy!